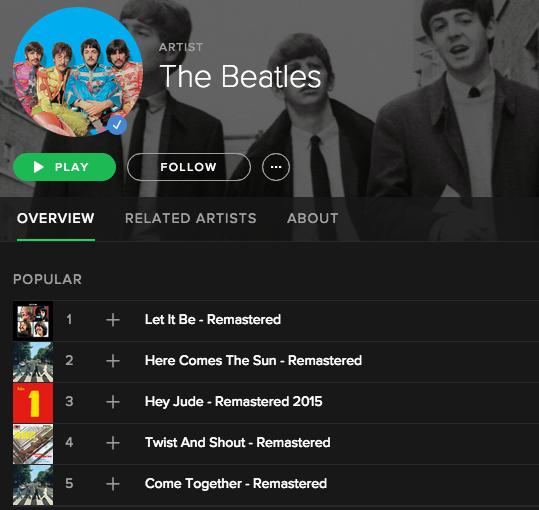 Float Down Stream: The Beatles are on Spotify! Naturally, let’s celebrate with a Spotify playlist. If you’re a casual Beatles fan, or you only have meager “greatest hits” albums, then this opening-up to the streaming world gives you an opportunity to explore some Beatles tracks that you haven’t heard before. To celebrate, I’ve compiled a Spotify playlist of 30 of my favorite Beatles songs that are NOT considered hits. They won’t show up in the “popular tracks” section and they won’t be featured on compilations like the best-selling 1, but these 30 songs are treasures not to be overlooked. So come on. Turn off your mind, relax, and float down stream. Click the link here or listen below.